As Ohio Governor, Kasich gave his final State of the State address at Otterbein University in Westerville in 2018. For most of us, January is a time to toss aside our old habits, adopt a renewed sense of purpose, and resolve to do better in the 12 months ahead. Sadly, that hasn’t been the case in Washington, where politicians rang in the new year with a needless government shutdown and endless replays of the politics-as-usual charade that made them so unproductive in 2018. But January also brings us a powerful reminder of the way we can address seemingly intractable challenges like this. Celebrating the birthday of Martin Luther King Jr., we see how the words and deeds of this great man point us toward resolving the breakdown of government and civility that has left Washington powerless to act on a multitude of problems here at home and abroad. King and his colleagues struggled throughout the 1950s and ’60s to achieve social justice and equal rights for millions of black Americans. While the Civil War had officially abolished slavery, it didn’t end discrimination and racism; yet moving the political system to further action had become a continuing struggle. When I reflect on King’s legacy, it’s clear that the reason he could never get politicians to create racial equality — even if they knew it was the moral thing to do — was because they feared it was too tough politically. Knowing that solutions would not, and politically could not, come from the top, he went around the politicians. He organized in neighborhoods and churches. He brought people — black and white, rich and poor, liberal and conservative — together to drive change and to bring greater unity in in communities across the nation. Because solutions would never get their start in Washington, he knew the solution had to be us. Today, when we’re again so divided, we need to use that same approach to attack the common problems that affect all of us. With the federal government so dysfunctional and creating more problems than it’s solved, it’s up to us as individual citizens to begin to take on many of these challenges for ourselves, within our communities. Instead of waiting for Washington to work, we can bring about positive change where we live, to make things work better, in whatever ways we can. Whether it’s drug abuse or poverty or bullying, infant mortality or poor-performing schools, we can take some matters into our own hands, right where we live. Solutions have to start in your house, in your church and your school — in your own town square. When people begin to work together on these local concerns, they begin to understand one another, respect one another, and like one another. They will rediscover their shared humanity and open their eyes and ears to the views of others. When we do that, we begin to heal our communities. Let me cite one challenge: street gangs and violence in our cities, large and small. That’s not an ideological challenge or a partisan issue, and neither are the solutions. Ending violence is about bringing the community together. We’re seeing that with the work of former education secretary Arne Duncan, who has been working with neighborhood nonprofits in Chicago to help get young men life-coaching and job training that’s turning around lives — and communities. Isn’t that what matters in the end? If we can help just one person to be better, we can change the entire world. And when we work together as a community to meet this challenge, who knows what we can accomplish? Instead of sitting around worrying about what’s broken and not working in Washington, we’ve got to get off the couch and figure out what we can do by ourselves — right here at home, where we live. Volunteer at the food bank. Engage with your schools if something needs to be fixed. Drop in on a neighbor who has no one else to listen. The opportunities are there, but we need to grasp them. That’s the cure for the breakdown in Washington. I haven’t given up hope that officeholders in Washington will eventually get their act together and, at long last, find the will to get things done on behalf of the people who elected them. Until then, let’s all make a Martin Luther King Day resolution to find ways we can begin to tackle problems in our own backyards. That is King’s message: the solution is us. 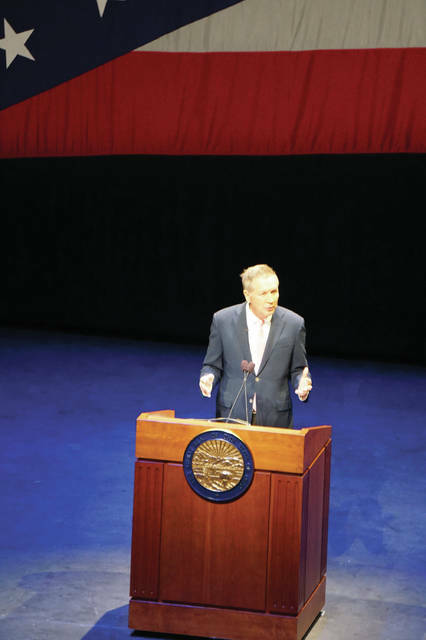 https://www.sunburynews.com/wp-content/uploads/sites/48/2019/02/web1_Kasich-at-lectern.jpgAs Ohio Governor, Kasich gave his final State of the State address at Otterbein University in Westerville in 2018. This column originally appeared in the Boston Globe. It was provided by Kasich for America.